Okay so tomorrow is a big day. 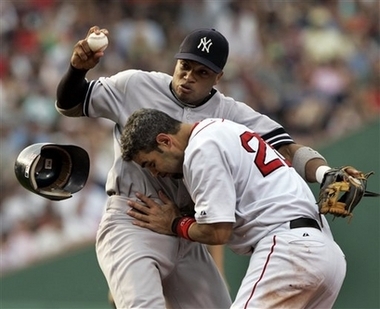 The Red Sox will play the Yankees for the first time this year. Tim Wakefield will be on the mound for Boston while Chien-Ming Wang will be starting for the Yankees. So far the Red Sox have gone one and one against the Rays and zero and two against the Orioles. 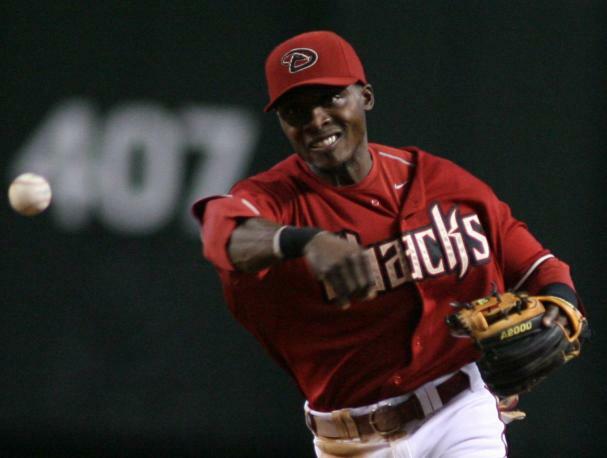 Now Spring Training does not reflect how a team will do because most of the players are prospects. Most of the Red Sox’s prospects are very promising but it could be up to three years till we see some of them in the majors. One good things about tomorrow is David Ortiz and Jason Bay will be back. I am sure they would rather be playing with their respected countries in the World Baseball Classic but I am happy to see them back. The only bad thing is Dustin Pedroia and Kevin Youkilis will be playing for team U.S.A. I would rather see Youk and Pedroia playing for team U.S.A. then the Red Sox and I am sure they feel the same way. When you play for your country it makes you feel special. When you play for your team it is your job. It is a privilege to play for your team but even a bigger one to play for your country. After the Yankee game in the next three days the face the Orioles Saturday and Sunday then the Blue Jays Monday. Sure the Orioles are not as big rivals and same thing with the Blue Jays but I think that any team in you divison is your rival and for that matter any team in your league is your rival. I am a little sad because I will miss the game tomorrow. I will be on a plane going to France for Spring Break tomorrow morning. I am sure going to check the score as soon as we land on my Dad’s phone though. Also I am sorry If I can not be on my blog and yours the next few days. I will try though. This should be a great game. This is the first test for many young players with the Red Sox. To be with the Red Sox you must have to deal with the pressure and beat the Yankees or I guess the Rays now. The Rays are becoming more of a rival to the Red Sox because for the next few years the Yankees will be eating the Red Sox’s dust. So far in the Spring Training standings the Rays are a game and a half above the Yankees and two games over the Red Sox. All right tomorrow night is the deadline to answer my super hard trivia question, “Who threw the first no-hitter under lights” So far the hints are . . .
1- It could have been in any league or country. 2- I have known the answer my whole life. 6- He was in the Yankees’ and Mets’ farm system at the same time. 7- He played for two different Yankee farm system teams. 8- He stopped playing in 1935 to work on a railroad so he could make more money during the great depression. 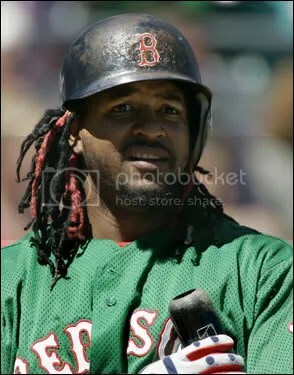 9- He played for the Quincy Gems. 10- The league he played in was the American Association. Today’s hints are, he has the same name as a golfer and that golfer hit a double boggy boggy on hole two in round two at the Ocean Course at Hammock Beach. Wow, that was quick. I already stumped you guys. The question was, “Who was the first man to bat for the American League in an All-Star game.” The answer was Ben Chapman. I only had one guy guess! Come on guys! At least try! I just got back from my baseball game and we got killed. Anyway since today was the first game of spring training I thought I would give you my standing predictions. 1- Red Sox, 98-64, Boston has it all; ton of pitching, sluggers, fielders, prospects, and chemistry. Chemistry wins championships. You can have guys that stink but have great chemistry and you can have guys you are all all-stars but no chemistry. Guess you would win? Thats right, the bad team with chemistry. Big Papi, Josh Beckett, and Jason Varitex will all have comeback years and lead Boston to first place in the American League East. Big Papi will have another Big Papi season hitting 45 home runs. Look for Jason Bay to have a great year. I mean how will playing with the Red Sox for a full season not help? 2- Yankees, 96-66 Just like I said it before chemistry wins championships. Money can not buy a championship. The Yankees need to figure out who will be in the outfield. The only lock in the outfield is Johnny Damon is going to be in left field. Will Nick Swisher and Xavier Nady platoon in right? What will Brett Gardner do? Another question is the catcher. Is Posada healthy? Will Kevin Cash even be in the majors? Then the biggest question is how will Alex Rodriguez fare? Will all the steroids talk go to his head? Or will he have another A-Rod type season and hit his 600th carer home run? No one knows. 3-Rays, 94-68, The Rays are now playing with every ones eyes on them. Evan Longoria is probably going into a sophomore slump and B.J. Upton will be pitched more carefully this year now that everyone knows how good he is. The Rays young pitching staff should improve. James Shields is one of the most underrated player in baseball and this season that will all change. Matt Garza also will be looked at more. Overall the Rays will almost stay the same, except for losing three more games from last year. For every negative there is a positive. They just do not have the money to keep up with the Red Sox and Yankees. 4-Orioles, 75-86, The Orioles aren’t ready yet by will be soon. They have young talent and have a few veterans. If they do want to compete they need a few more veterans. Maybe go out and try to get Ken Griffey Jr. or they could go get Pedro Martinez. The biggest reason the Orioles will compete in maybe 2010 is due to catching prospect Matt Wieters. Wieters has not even played a major league game and is being compared to Yogi Berra, Johnny Bench, and Carlton Fisk. Wieters should start this season. Greg Zaun should be the backup catcher and if Wieters for some reason can not handle major league pitching then Zaun can step back in. 5- Blue Jays, 70-92, The Blue Jays had a bad offseason. They lost A.J. Burnett to the Yankees and Vernon Wells is out for a while. Alexis Rios should have a better year then last season maybe hitting thirty home runs. Roy Halladay should have yet another fantastic season maybe even winning twenty games. Lastly Travis Snider and Adam Lind should have a good year possibly having his breakout year. Now to the negatives. Behind Roy Halladay the Blue Jays rotation is to things. It is a big fat question mark and they stink. No one really knows how Matt Clement will fit in with the team. Probably he will be the fifth guy. The other negative you might ask? There are few positives. 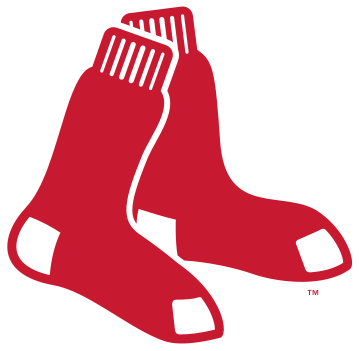 Programing Note- Look for more predictions to come during spring training and tomorrow look out for a recap of the Red Sox versus Twins game. Now to today’s question. When Connie Mack retired as manager of the Athletics following the 1950 season, who replaced him? Hopefully I will get more then one answers for this one. Dale Murphy is on the ballot for the eleventh time. He hit .265, with 398 home runs, drove in 1,266, scored 1,197 times, had 2,111 hits, stole 161 and was caught stealing 68 times. Murphy played for 18 seasons with the Braves, Phillies, and Rockies. If he does go in it will be as a Brave. In just an eight span Murphy won two MVP’s, along with six golden gloves, four silver sluggers, the Lou Gehrig award, and the Roberto Clemente award. In that same span he was elected to seven all-star games. This year he will get 15% of the vote and at his best 45% of the vote. Jesse Orosco is on the ballot for his first time. He has a carer record of 87-80, with an ERA of 3.16, and 1179 strike outs. Orosco, a relief pitcher is the all-time leader in appearances. He played 24 seasons with the Mets, Dodgers, Indians, Brewers, Orioles, Cardinals, Twins, Yankees, and Padres. He played with the Dodgers two different times. He made four errors at pitcher. He had a great .984 fielding percentage. Orosco is my favorite player on the ballot to not play for the Red Sox because in 2003 in 15 games for the Yankees he had a 10.38 ERA. Orosco will get 7% of the vote this year and his high will be 45% of the vote. Dave Parker is on the ballot for his 13th year. He hit .290, with 339 home runs, drove in 1,493, scored 1,272 times, had 2,712 hits, stole 154, and was caught stealing 113 times. He made 144 errors at first, second, and in the outfield. He has a .966 fielding percentage. Parker played 19 seasons with the Pirates, Reds, A’s, Brewers, Angels, and Blue Jays. Parker if he goes in will go in as a Pirate. He won two batting titles, three golden gloves, three silver sluggers, and a MVP. He also was elected to eight all-star games. I think Parker should go in. He just missed 3,000 hits and had great stats otherwise, but I don’t think he will. Last year he got 15.1% of the vote I think this year he will get 17% of the vote and his best will be 24.5% of the vote back in 1998.